Presented by Sir Sourindro Mohun Tagore. 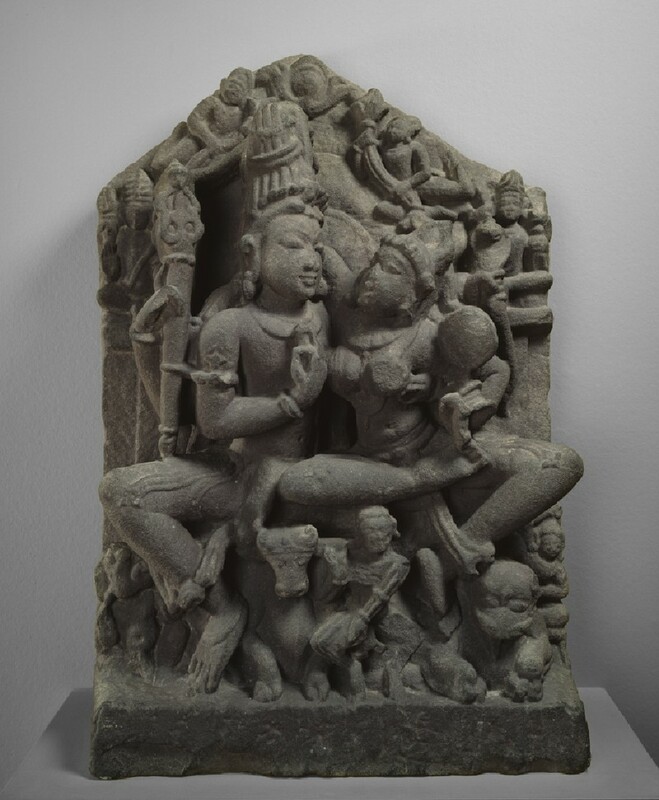 This is probably the archetypal icon of the later Hindu period in North India and parts of the Deccan. 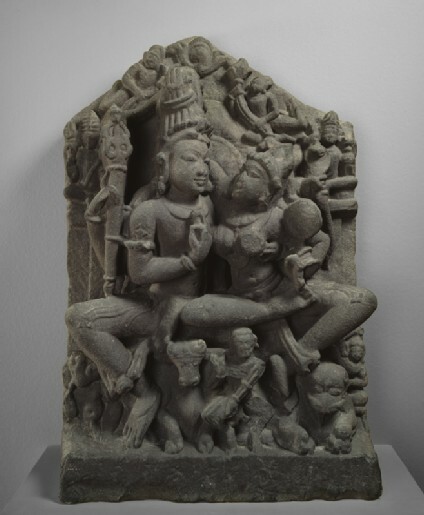 Śiva (Maheśvara, the “great god”) sits in lalitāsana (the same pose as in [EA1971.14 and EA1965.161], with Umā (another name for Pārvatī, Śiva’s śakti or divine Power), seated on his left thigh, her right arm thrown around the neck of the god; in the other hand she holds a mirror. Śiva, with his unusually tall jaṭā-mukuṭa (the crown entwined with the matted hair of the ascetic and adorned with the crescent moon), is four-armed. His two upper hands hold the trident and a tricephalous serpent, his lower left clasps Umā around the waist, while his lower right in vyākhyāna-mudrā, the gesture signifying spiritual instruction, is placed near her right breast. Below are the usual assemblage: Śiva’s offspring, Gaṇeśa and Skanda (Kārttikeya), the latter barely indicated by a crude little peacock’s head, Nandī the bull and Bhṛṅgi, the skeletal ascetic, in a dancing pose. The lion, rarely represented in this icon, is Umā’s vehicle. Above, under a pair of flying celestial beings bearing garlands, sit two deities, whose emblems and implements are difficult to discern, but they most likely are Brahmā, because of his paunch, on the proper right, and Viṣṇu on the left.